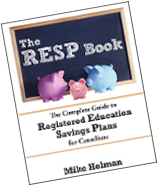 Exciting week here with the announcement of my book, The RESP Book which is available on Amazon. Make sure you tell everyone you know about the book! The first ever Canadian Real Estate Carnaval was published this week over at Land Lord Rescue. It’s a great collection of real estate articles so check it out. My friend Tom over at the Canadian Financial Blog has launched a new site called “Money Index” – it’s pretty good. It shows the last 5 posts for various personal finance blogs, so it’s a great way to catch up on your favourite sites as well as find some new ones. Beating the Index wonders if plug-in electric cars will reduce oil demand. It doesn’t seem very likely. Consumerism Commentary wrote an interesting piece on specialism vs. generalism. It’s hard to know which way is better. My career as a computer programmer has definitely been the result of specialism, but this blog represents generalism. Have you heard of one of those charities where you buy some livestock and send it to a farmer in Africa? One person decided to track down their goat. Canadian Dream wrote about a real estate investment “deal” that wasn’t so great. Really good article. MapleMoney goes over the basics of the Smith Manoeuvre. Michael James takes a look at the Canadian Tire high interest savings account teaser rate. Larry MacDonald really likes the book 10 Things I wish someone had told me about retirement, written by Jim Yih. In fact, he said the book left him gasping. Today’s Economy finished off the series Class of 2008. Very interesting story. Investing Thesis has 10 stocks which are trading above their pre-2008 highs. The Oblivious Investor says that stocks are not a Ponzi scheme. Free From Broke wrote about portfolio diversification. Boomer says that some hobbies are expensive. She suggests trying it out in a class first. Canadian Capitalist asks if retirees require guaranteed minimum withdrawal products? It would be nice, but the ones available in Canada are way too expensive. Million Dollar Journey covers some methods to track your spending. I should try this sometime. Young and Thrifty reviews the iPhone 4. Financial Blogger tells us what is cool about living in Quebec. I’d add proximity to Mt. Tremblant to the list. For any fans of Men Without Hats out there (I used to love them), here is a very bizarre video spoof of their most famous song. Thanks to Brip Blap for that one. Thanks for the mention. I liked the goat search. Not sure who I should talk to but I would like to take part in the Top stocks competition next year. Thanks. One doesn’t often hear financial planners dissing mutual funds. Folks, please watch for a Q&A with Mike on his new book. It’ll be up on Monday.